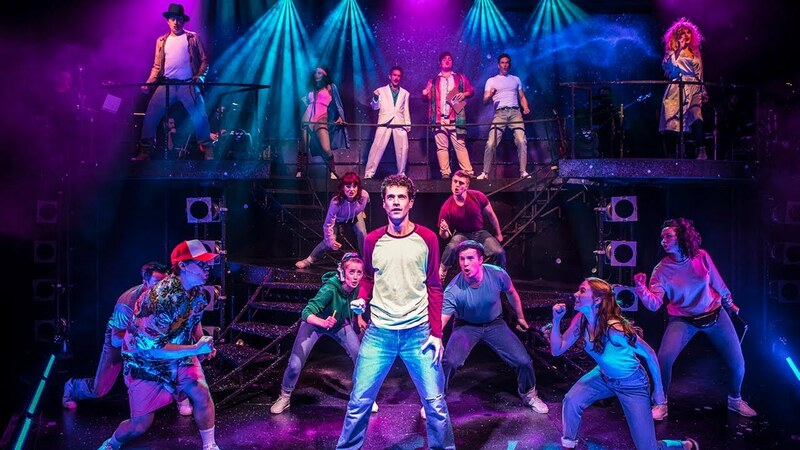 Eugenius is The Other Palace’s latest production, where once again it is bringing a fresh new musical to London audiences. 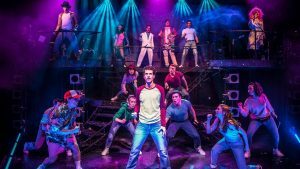 Until now Eugenius only had a one night try out at the Palladium but now Eugenius is ready to take London by storm for a limited run. Eugenius tells of Eugene, a geek who adores comic books. By night he dreams of ‘Tough Man’ and ‘Super Hot Lady’ and by day he draws his dreams into his very own comic. When Hollywood comes scouting at his school, his friend Janey gets his comic noticed. Soon Eugene is whisked away to Hollywood where he meet Lex, the Hollywood big shot. Things however don’t quite go according to plan when Eugene’s story begins to blur with reality and Janey and Feris return to Hollywood to save Eugene. The show is packed full of catchy songs written by Ben Adams and Chris Wilkins which just will not leave my head. 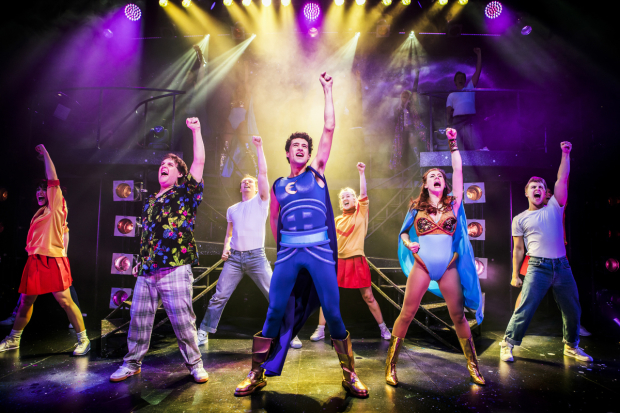 They all have an 80’s vibe to them and range from power ballads (Comic Book Kind of Love) to funny ‘Maniac’ style dance numbers (She’s Amazing) to Journey-esq ‘Go Eugenius.’ Since seeing the show I have had the soundtrack on repeat. It’s rare that I walk into a musical which I am unfamiliar with the music and leave being able to sing so many of the numbers and that is testament to the strength of the score. The story and script is all very light-hearted with some great 80’s references within it. It is a show that you can’t take too seriously. With songs like ‘The Dance of the Fish People’ and ‘The No Pants Dance’ those looking for a thought provoking theatre trip should look elsewhere but due to the silliness of it all it leaves you grinning from ear to ear. The cast themselves fit their roles like gloves. Liam Forde as Eugene is the perfect geek although I didn’t know geeks could sing like that!! Laura Baldwin as Janey gets the tricky balance of comedy and a believable character just right. On top of this her voice makes these huge songs sound easy. Her solo number ‘The Future’s Bright,’ was one of the highlights of the evening for me, with a Britney Spears vibe (I know that’s 90’s but I love Britney), a fan, cheesy backing singers and Baldwin’s voice merging together in this hilarious number. The rest of the cast are equally as fabulous with Cameron Blakely as Lex oozing Hollywood sleaze, Melissa James as Carrie/Super Hot Lady leaving me with a huge girl crush as she lived up to her name….especially in her wonderful Superhot Lady costume, Shaun Dalton as Gerhard/Tough Man with his clever nod to Schwarzenegger and Daniel Buckley as Feris with his ability to rap at the same time as portraying a huge geek. I could go on to single out all of the cast but suffice to say each one them really add to the overall craziness and success of the show. The set is a simple 3 level which Renfree makes great use of in his choreography and Ian Talbot, equally so with his direction. Although a relatively small cast the stage is always bursting with energy. The lights are left to do the rest of the talking, transporting you to a 80’s rock concert. Eugenius is playing at The Other Palace until 3rd March. To buy tickets and find out more about the show visit the Other Palace’s Website. If you liked this review you might also like my preview piece about the show which includes photos fro the rehearsal room and interviews with the cast. Pingback: The Musical Theatre Quiz at The Other Palace- Musical Theatre Musings Take on it!